What Do you Think The Pros & Cons of the X Are? I’m curious to know what some of you Love & what you dislike about the VTX 1800. I know some of your experiences, preferences will be unique in your own perspectives. Let me begin by saying that my addiction with the X started about a year before I actually bought mine spring of 2017. My previous Scoot was a 2003 Honda Shadow ACE. While I really liked the ACE (yes I am partial to Hondas) I felt that it was really underpowered for my needs despite any mods I tried to do it. One of my buddies that I ride with was selling his 2002 1800C & was holding off on posting it online pending the sale of my ACE which didn’t end up happening mainly because the market was saturated with Honda Shadows & I had no takers. I didn’t end up getting that one as he couldn’t wait any longer. Fast forward to Feb 2018 in the dead of winter I saw an add for a 2006 1800C for $5,500 with 25,000 miles on it. This was an older gent with bad knees said he was looking for a lighter ride as the X was too heavy for him now. He had expressed interest in my Shadow as he said that would be the perfect size & weight for his situation. Now here is my own opinion about what I like & dislike about the X & I’d really like for you guys to chime in on your opinions/experiences as well. As a note, I have a 1300r, not an 1800. Aftermarket support is dying out. I came from a Kawasaki ZX12r Ninja that was in production model years 2000-2005 (in the US, 2006 overseas) only. So, there was limited aftermarket support for that bike even when in production. 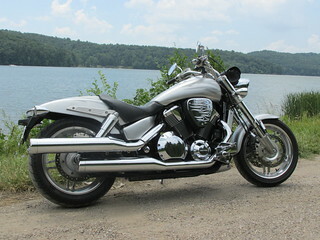 The VTX even at it's age seems like the Ford Mustang aftermarket to me (so much more then my last bike)... But, unfortunately, manufactures have to move on to newer, still in production bikes. 1300 does not get very hot, not as top heavy. One cleaning of Ign switch and TS switch in 189k miles is not bad. I did have relays for a few years to switch HL current, when I went to Led lights then the 60% current drop no longer needed the relays. steveroy60 and DrDolittle like this. That's a good point that I forgot to mention. A lot of parts and accessories for the VTX her simply not being manufactured anymore. Therefore Ali their end up getting nothing or have to resort to the use Mark and if it's still available. It's also worth noting since I have a brown Mustang seat, getting matching saddlebags are a pain in the rear end. I had to order mine out of a place called Viking luggage Mountain California. They're currently on backorder and I'm still waiting. RODS X, steveroy60 and DrDolittle like this. Last edited by TennX; 04-01-2019 at 11:38 AM. a downgrade, smaller lighter. .... I test road a few VTX's.... and learned late 2004... the New 2005 1800 "F" was about to be put into production..
so I ordered one.. and still have it today. 86,000 miles..
my wings always had a stable mate of a sport bike.. 1984 to 2002.. different of each along the way. 9 Honda's in my life.. 50 years.. no gaps ..
the 1800... is a little of a goldwing... and a bit more of a sport bike. forward controls... for my bad knees.. so I can continue to ride. and I still hang-off.. just for fun.. and dragging pegs..
DrDolittle, Krom and Nonsequitur like this. Last edited by chuck_VTX F; 04-01-2019 at 11:53 AM. and I hope I'm not done trying all of them one at a time. I also owned a Honda Shadow ACE before my VTX 1800C which I traded in 2003.
less cruising feeling than a Harley, the main reason I also have a Fatboy. Last edited by fastspek; 04-01-2019 at 03:03 PM. I have a 02 1800c. I wish it had a bigger fuel tank. That's the same and only 'issue' I have with my 2003 1800s. It just means I have to stretch my legs every 2 hours instead of 2.5 hours and on longer trips in some states have to plan fuel stops a little more diligently.